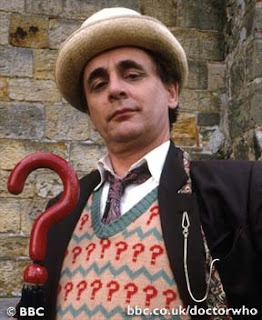 Sylvester McCoy (born Percy James Patrick Kent-Smith August 20, 1943) is a Scottish actor. He is best known for playing the seventh incarnation of the Doctor in the long-running science fiction television series Doctor Who from 1987 to 1989 and in the 1996 Doctor Who television movie. He took over the lead role of Doctor Who in 1987 from Colin Baker, and remained until the series was shelved in 1989 (see List of Doctor Who serials). He played the Doctor in the 1993 charity special Dimensions in Time, and again in 1996, appearing in the Doctor Who television movie where he handed the role over to Paul McGann. In his first series, McCoy, a comedy actor, portrayed the character with a degree of clown-like humour, but script editor Andrew Cartmel soon changed that when fans argued that the character (and plots) were becoming increasingly lightweight. The Seventh Doctor developed into a much darker figure than any of his earlier incarnations, manipulating people like chess pieces and always seeming to be playing a deeper game. McCoy generally approved of this, as it allowed him to play more of a dramatic role. A distinguishing feature of McCoy's Doctor performances was his manner of speech. He used a slight Scottish accent, rolled his 'r's, and often placed emphasis on unusual syllables or words. This has the added (possibly intentional) effect of sounding a little alien, and wrong-footing the audience. Some viewers, however, took it as evidence of McCoy's limited acting ability. At the start of his tenure he used proverbs and sayings adapted to his own ends (eg. "There's many a slap twixt cup and lap" — Delta and the Bannermen), although this characteristic was phased out during the later, darker series of his tenure. At 5'6", he is the shortest man to play the Doctor.